So this movie was a nice surprise. Ever since Gravity came out back in 2013, I tend to hold ever space catastrophic, do or die situation, film to it's standards; (yes that movie is just that good). So when I heard about this movie I immediately thought it was going to be just another alright movie because one I wasn't too thrilled with Matt Damon at the current moment, and two, movies that were considered to be epic this year have greatly underwhelmed me to say the least; (hi Jurassic World). But me being the lover of films, and resident movie critic here on Cold Knowledge, I had to give this movie a spin to see if all the hype was real. Keep in mind my early disdain for Damon at the current moment, (even though I enjoy his movies .. sometimes), I came into this objectively. Right off the movie didn't waste anytime with a boring and long winded dialogue that all Mars movies seem to kick off their movies with. Instead The Martian hopped right into full crisis mode and went on from there. While I already had it in my mind that this was going to be a whole Cast Away deal where we would get more shots of Damon on Mars going crazy than the actual happenings of the rescue mission to get him. I'm glad they had a well enough balance of Damon, the team back on Earth trying to bring him home and then eventually bringing into the fold his team that left him on the planet because they supposedly thought he was dead. 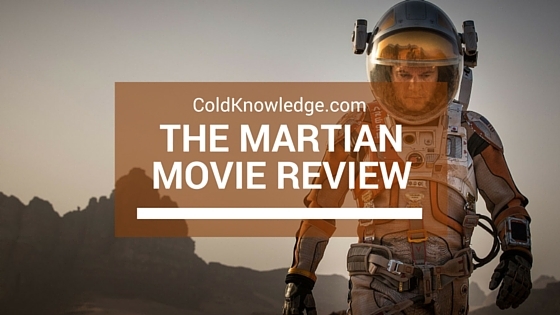 The plot and story line was predictable to say the least, but Ridley Scott never let the suspense lift for a moment. He managed to keep me enthralled with the fact that he was surviving, crude humor and the desire to see him come home. In addition to exceptional directing of sub par story, rehashed story, the cast all held their own and I believe that's what made the movie better than it was as well. In addition to Matt Damon, Jessica Chastain, Michael Peña, Kate Mara, Sebastian Stan and Aksel Hennie lead the team of astronauts that were on the manned mission to mars. Jeff Daniels, Chiwetel Ejiofor, Sean Bean, Kristen Wiig, Benedict Wong and Donald Glover provide an excellent support team that work around the clock to bring them all back home in one piece. The cast included a lot of heavy hitters in there and they all meshed and played their roles and they did it very well. All in all this movie was pretty good, all things considered. It was definitely one of the better movies that came out this year and it's near the top of the list. I'm definitely giving this movie a strong C+ and that's not a bad thing at all. I will probably end up watching it again when it comes out on Blu-Ray and I won't be mad that I did. If you like movies that are suspenseful, with marginal action, then this movie is for you. I would even recommend this movie as a one off for those that are looking for something fun to watch. Have you seen this movie? If so then I would love to hear about it in the comments below.